Looking for the true wireless headphones that people can hear you clearly on the phone and you can also enjoy stereo sound? Here it is. allowing hands-free control music are two latest tech to ensure music enjoyment. 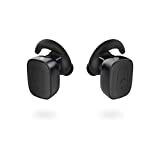 -Bluetooth 4.1: fast transmission speed and hyperstable connection ranging beyond 10m/33 feet indoor or outdoor without cutting in&out around corners. that save your time without fiddling with the phone any more! -Low battery voice promt&blink: knowing when to charge your earbuds without power off abrubtly during use. 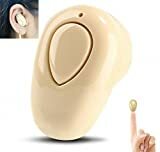 The big battery in such small body of wireless earbuds is unreasonable. Yet our earbuds still can maintain 3h under normal volume 30%-40%, taking 2h for full charge. The USB cable port avoid the problem if a cradle broke you have to buy a new pair of earbuds, which is a waste of money! 45-days no reason to return& 1-years guarantee.